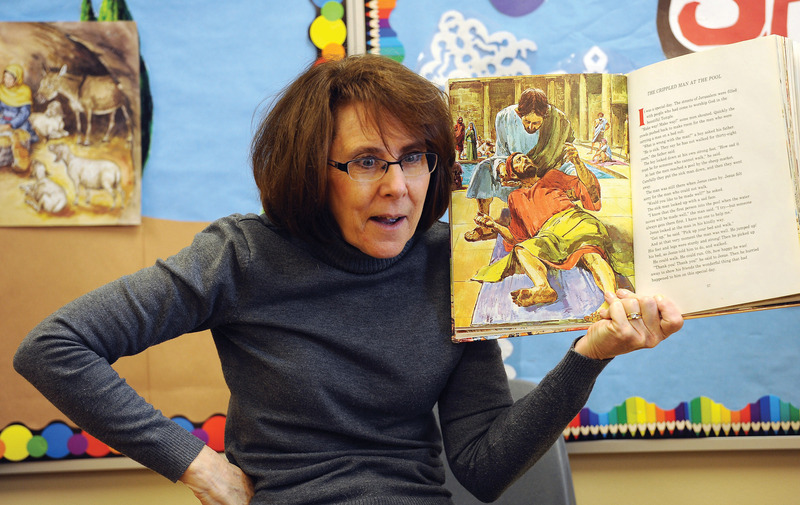 As Esther marks her twenty-fifth year directing the Wheaton Bible Church Weekday Preschool, we sat down with her to learn a little about her life and her years of teaching children and ministering to their families. Let’s start by learning a little about your growing-up years. There were five children in our family, and we grew up in rural Colorado. My father was the pastor of an Evangelical Free Church that had more than 120 acres of land and a congregation of 100 to 125 people. It was very small, but it really met the community’s needs. Our house was attached to the church—the two structures shared a common wall, so I lived, ate, and breathed church every day. On Sunday mornings the people in church could smell the pot roast we would be having for dinner. When did you come to faith? Growing up in a pastor’s home, I knew a lot about God and Jesus. And I knew I wanted to go to heaven, so as a five-year-old, I accepted Christ as my Savior. I realized that the Christianity my parents had talked about needed to be real to me—I needed to accept it for myself. Starting at the age of sixteen, I spent those summers living by myself in a camper that I moved from town to town. A missionary would drop me off for the week, sometimes at a little church, sometimes at a community center, and I was their Vacation Bible School teacher for that week. I did a lot of growing during those years, and God’s Word became real to me. At night I’d go into my little camper, pull out my Bible, and realize that I wasn’t alone. God was with me. Do you think that experience influenced your college and career plans? Yes. I always knew I wanted to work with children. Even before those summers teaching Vacation Bible Schools, my mother and I were very involved with Child Evangelism Fellowship, leading after-school clubs for children in our area. I chose to attend Trinity College in Deerfield, Illinois (now Trinity International University), for two reasons. First, because our church in Colorado was part of the Evangelical Free Church denomination and Trinity was the Evangelical Free Church’s school. Second, Trinity had a very strong elementary-education major. So your education brought you to the Midwest? Yes, and that was where I met my husband, Jeff, who was also a student there. I stayed at Trinity for a couple of years after graduation, working in their development and alumni offices. I travelled around the country promoting the school, and I worked on magazines and other development materials. Then I wanted to try something different, so I spent a lot of time praying and talking to God about it. About that time I ran into a person at Wheaton Bible Church (where Jeff and I have attended since we graduated from college), who worked at IBM. He said, “We have an opening in our office, and you’d be a great marketing representative.” I went and interviewed and ended up working for IBM for the next six years. During those years Jeff and I got married. Working at IBM was awesome, but when we started our family, it was pretty clear that I couldn’t travel, which was a big part of that job. Jeff and I have two sons, now in their thirties. Our older son, Steve, lives in Boston, and Mark lives in Seattle, Washington. After the boys were born, I did a little work at home, but mostly I was just caring for them until I began working with the preschool—which was about the time Steve was a student there. What was your role in the preschool then? I was on the board and also worked as a substitute teacher when needed. How long had the WBC Preschool been open at that point? About eight years. 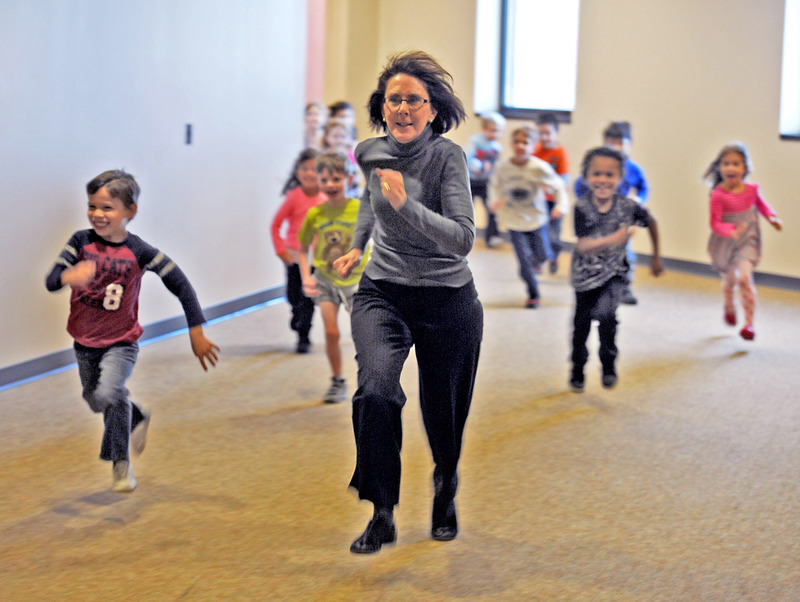 The preschool opened thirty-two years ago, in May of 1982. Chris Lyons, then Pastor of Wheaton Bible Church, and RobAnne Burns, the wife of one of the WBC youth pastors at the time, wanted to do something for the community where our church was located. From that desire came the decision to start a preschool, not just for the people of our church but as a way for the church to reach out to and serve the community. Similar to the way Puente del Pueblo is serving our West Chicago community? Yes. They wanted an enrichment preschool program that would prepare children for their next step in education, so it needed to have a strong school-readiness curriculum. But they also wanted it to be a preschool that was unapologetically Christian. Twenty-five years ago you became the director. I spent time praying about it, and in my daily devotions at the time, I was reading the story of Elijah passing the cloak to Elisha. I’d say, “No, God. I don’t have the experience.” But it became clear that was what I was supposed to do. Ellen was sure that this would be the next step for me, and I’m glad she saw that, because I loved it right from the start, and it’s been my passion ever since. What particular highlights stand out for you over the years? A more recent highlight would be the way the preschool has changed with the move from downtown Wheaton. Its purpose and goal in Wheaton was to serve the community. The school district would refer families to us, and we would work with the district. I really felt like we were partners, and the community really embraced us as a neighborhood-church preschool. Families came from all over Wheaton, and that’s where most of our enrollment came from. When we moved our campus out to West Chicago, I loved that the preschool took on the church’s vision of reaching out to DuPage County. 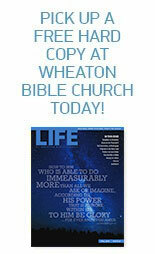 God had His purpose for us in Wheaton, and now we’re an outreach into a new area. We’re drawing students not only from Wheaton and West Chicago but also from Carol Stream, Winfield, Glendale Heights, and Bartlett. It’s also interesting that we continue to have roughly half our students come from families that attend Wheaton Bible Church, and the other half come from the community. The other thing that’s happened since the move—something I really love about our preschool—is the diversity of the children who are coming to us, and the different nationalities they represent. Last year in one class, English was a second language for 60 percent of the children. Some of the languages represented include Spanish, of course, because we have a number of Hispanic families, but we’re also reaching some Middle Eastern families. We have Filipino, Korean, Ukrainian, and Russian families and several Brazilian families. A mom from Brazil came and visited last year and told her friends. She sent four families to the preschool this year! I told her I was going to have to start paying her as my new marketing representative. Which leads to the question, How do people find out about the preschool? As with the Brazilian families, a lot of it is word of mouth. Families of current and former students, who loved the preschool for their children, are telling their neighbors. Parents put it on Facebook. They are my best advertisement. Other people drive past the building and wonder what’s going on here. When they find out that we have a preschool, they’ll often come in and ask for a tour. Walking those parents through the facility is a very fun part of my job. When a family is asking about the preschool, how do you describe the faith elements of the program? It’s really written all over our classrooms. The Bible verse we’re learning is up on the bulletin board. So as I begin to show them the classroom, I point out the Bible verses and talk about the Bible stories we incorporate into our curriculum. I explain that just as we’re reading other books with the children, we’re also reading the Bible every week. How do the parents respond to that? Each family is on a different journey, but as I talk about the preschool’s goals and objectives, it’s so wonderful when parents say to me, “I don’t know anything about the Bible. How can I learn about the Bible?” We’ve been able to invite them to Alpha and other programs. We have parents who have gone through the Alpha class and become Christians as a result. Some parents ask those questions right away. Others become more comfortable asking deeper questions over time, as we walk through life with their families, seeing them day in and day out. They see a difference, and then they want to have that as part of their lives. When they do ask those questions, we share the Gospel with them. There are many wonderful stories of changed lives among our preschool families. Talk about how you’re seeing faith built into the lives of children. Our mission as a preschool is to teach children to love God, love others, and love learning. Part of that is memorizing Bible verses—and they really know them. Recently a mom told me she had been in a movie theater with her little boy, who was so proud that he had learned his Bible verse. They were waiting for the movie to start when all of a sudden he shouted out, “The Lord is my strength!” She said it was great to see her son’s confidence in knowing those words, and it didn’t matter to him where he said them! We also know that developmentally, preschoolers are at the age where their hearts are beginning to become aware of what is right and what is wrong. Recently I taught a lesson about making choices in what we say and do. The children listened eagerly as they learned that they were big enough to know that Jesus gave us a choice between what is right and what is wrong. I encouraged them to make sure their eyes were looking at things that were right, make sure their ears were hearing what was right, and make sure their tongues were speaking kindness. Tuesday and Thursday mornings this year I teach the three-year-old class. But we have nine classes this year, so I’m in and out of all the classrooms, taking on children who need a little extra attention and helping in other circumstances when special accommodations are needed. I really want to do what needs to be done, and to have an impact on people’s lives, you have to be right there with them. Mostly I just love being with the children. They are my favorite little people. You mentioned ministering to families. An important part of my job is walking through life alongside our families. Many of them are dealing with challenging circumstances—some real heartaches. I want to respect their confidences, but I will say that in those situations, we have the privilege of praying with them, counseling them, being Jesus to them, and loving them throughout the year. Is there an administrative side to your responsibilities? Yes. Another hat I wear involves the requirements related to our licensing by the Illinois Department of Children and Family Services. Any early-childhood program that cares for children for two-and-a-half hours or more a week must be licensed, so we are making sure that we carefully follow safety and health regulations, that we’re well documented, and that we conform to the state-established guidelines and standards. These include everything from the physical equipment in the classroom to our curriculum—that we’re actually teaching a balanced early-childhood program. The preschool classes are divided by age. 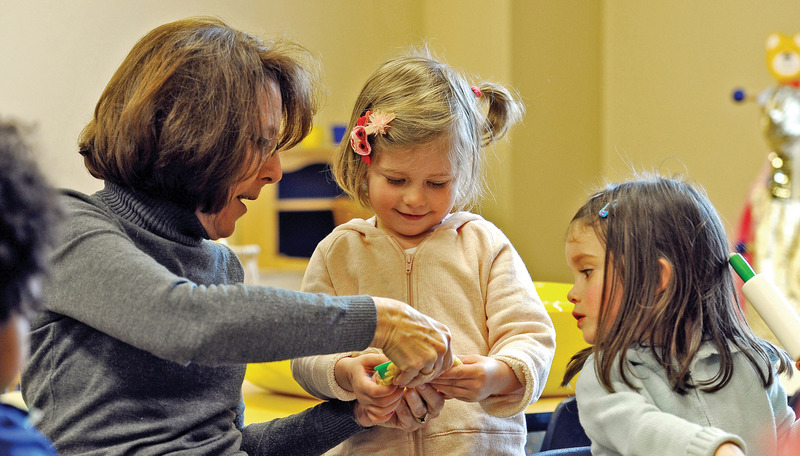 What are three-year-olds like when they first come to the preschool, and what stages do you see them pass through? Three-year-olds are mainly concerned with me, me, mine, mine. Then they turn four, and the developmentalists say that to a four-year-old, you are either their enemy or their friend. So as children are trying to navigate away from “me” and “mine,” our goal is to show them what it means to love God and to love others, to build relationships with other people. We want to reinforce the need to be kind and to be loving to one another. The classroom is a great place to reinforce those lessons. Along with teaching one of the classes of three-year-olds, Esther is in and out of other classrooms, adding one-on-one time with individual students. Fours are called “wild and wonderful,” and if you have a four-year-old, you just know what that means. Sometimes they are so excited about life that they can barely contain themselves. But they’re also just so wonderful because now they love their moms and dads and they love their families. Five-year-olds have reached what’s called the “peace year.” They’ve arrived and life is good. They haven’t started school yet, and everything about life is just fun. They’re such eager learners. Looking over a typical school year, are there special moments that you anticipate and particularly enjoy? A particular highlight for me comes at Christmastime, because in our preschool every class celebrates Jesus’ birthday and our families are involved. Last year we had about five hundred family members come to the various programs. The three-year-olds do a Christmas celebration in the classroom and say their Bible verses from September, October, November, and December, and sing some of the Christmas songs like “Away in the Manger.” Then the children and their parents make Christmas ornaments together. It’s a fun family time. The pre-K class program tells the story of the little drummer boy, asking, “What should we give baby Jesus?” Groups of children dressed in various costumes ask, “Should we draw Him a picture?” “Should we give Him a cookie?” “Should we give Him a horse to ride?” In the end they decide the best gift we can give Jesus is our heart. It’s a very sweet time with the families as they say their parts and sing songs. Another personal highlight is a way we reach out to the community. Our pre-K class takes one field trip a month, and one of those is a visit to the Windsor retirement center to do a little program. After we sing and say our Bible verse, we spend time visiting with the residents. Leading up to that visit, we teach the children how to walk up and shake hands with someone and say, “Hi. How are you? Here’s a picture I drew for you.” We also have a time when the residents color a picture with the children and give their pictures to a child to take with them. I just love it, and the people at Windsor love it, because the men and women we visit there aren’t able to get out much. There are so many highlights. Every year you look back on the different stories of how God has used the preschool in families’ lives, and you just enjoy them all. You are also a Sunday school teacher. Yes. There’s nothing more fun than watching a child as he or she hears the story of our great God and the miracles He does every day. Working with children is not just a job for me; it’s a passion, so I choose that for my volunteering as well. I have been part of the Children’s Ministry team for the past 38 years. And I choose to teach three-year-olds because it gives me the opportunity to impact little ones at one of the most foundational and formative times in their lives. What do you see as the most significant impact of the preschool? I love watching God work, transforming the lives of boys and girls and their families, of seeing that happen on Sunday mornings, but also during the week as our preschool offers us the opportunity to introduce the Good News about Jesus to children and moms and dads and to walk alongside families through the important preschool years. This week in our Bible-story time with the three-year-olds, we told the story of how Jesus loves little children and how He said, “Let the children come to me.” My passion for each and every child that comes through the preschool doors is that they will know that Jesus says, “Yes—come to me.” Jesus knew that children need to know His love now and in the lifetime ahead of them. We can begin to teach them now about this great love, and although that doesn’t mean their lives will be without hard times, they will have Jesus to walk with them every step of the way.